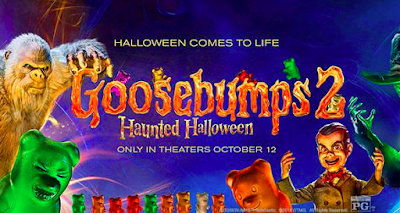 Read Will's review of Goosebumps 2: Haunted Halloween. Halloween comes to life in a brand-new comedy adventure based on R.L. Stine’s 400-million-selling series of books. Another chapter in the Goosebumps universe tells the tale of middle-schoolers Sonny (Jeremy Ray Taylor) and Sam (Caleel Harris) finding a book while working a job by picking up junk in an abandoned house, and unwittingly set loose the evil living dummy Slappy from the first Goosebumps movie in 2015. At first, they thought it was cool and brought it home with them. Soon they realize that Slappy has other plans and with the help of Sonny’s sister Sarah, (Madison Iseman) try to contain a slew of other creatures released on this Halloween town. I thought the three kid actors had good chemistry with each other and while being a movie of the spooky nature, it did have some funny moments as well. There were some very funny veteran comedic actors Ken Jeong as the wacky neighbor, Wendi MeClendom-Covey the mom, and Jack Black as R.L. Stine. This movie is relatively short at about 90 minutes, it doesn’t overstay it’s welcome. There is little bit of character development that does a adequate job of setting up for the finale. The last act was energetic with lots of scares and laughs. I think kids will have a good time with this and adults should find some things to enjoy as well. All the actors know exactly what kind of movie this is, and played into it. So I did have a good time and enjoyed this one and If you liked the first one then this is much the same. The plot is a little on the silly side but I think kids above 8 could watch this without getting too scared.